The new Mercedes-Benz S-Class will be the first car to have auto LED lights as standard, while optional extras will include adaptive LED headlamps that adjust according to environments. Soon the new S-Class from Mercedes-Benz will become the first vehicle in the world that will not use a single light bulb in standard versions, says manufacturer Daimler AG. Instead, the car will use over 190 LEDs that will light the road ahead, also including the vehicle’s exterior, interior and luggage compartment. The company says that it is making a complete change to LED technology after the introduction of electric lighting in vehicles for a long while . Even the entry-level model in the new luxury saloon range will come with all-LED lights. A number of intelligent supplementary functions including Adaptive Highbeam Assist PLUS can be added as choices. In addition to adaptive LED headlamps, the new S-Class will use a new system to reduce the intensity of the LED brake lights at night-time or while waiting at traffic lights. Of course, Daimler’s rivals have also been hard at work introducing LED lights into their cars. Audi has offered LED headlamps on its R8 for several years, and ran a TV advertisement during the 2012 Super Bowl that specifically highlighted the benefits of LED headlamps. Also, there is an excellent Audi website focused on LED lighting and its applications in different Audi models. The new low-beam LED headlamps require 34W per vehicle to produce the same light output, compared with 120W for halogen and 84W for HID (xenon) light sources. This meas a saving of up to 0.05 litres of fuel per 100 km travelled, or 2.1g of CO2 per km, compared to a vehicle fitted with low-beam halogen headlams. 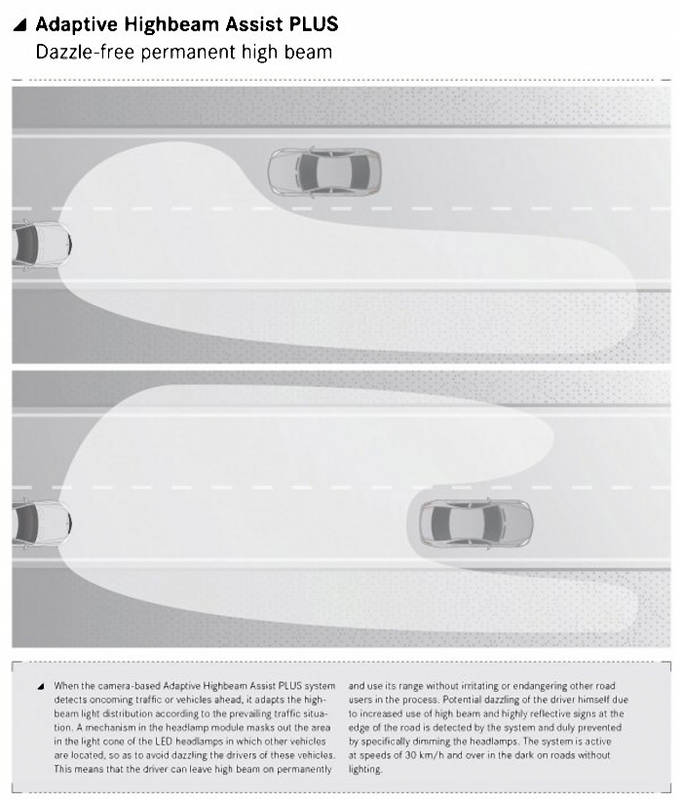 The Adaptive Highbeam Assist PLUS allows the high-beam LED headlamps to be kept on always while driving by shielding other road users detected in the beams cone of light. If the camera-based system checkes either oncoming traffic or vehicles ahead, it will adapt the high-beam light distribution according to the specific situation. As a result, the driver can simply leave the high-beam headlamps on all the time and use their full range without influencing other road users. There is no need to turn them on and off manually. The systems camera includes an image-recognition algorithm that can start a mechanism in the headlamp module. This masks a portion of the LED headlamps high-beam cone of light to prevent oncoming drivers from glare. If road users are detected outside the area that can be masked – for example when cornering with multiple vehicles in the headlamps beams – the system will switch to the familiar system of headlamp range control using the low-beam headlamps. Mercedes-Benz has released another world first by developing LED tail-lights with multi-level functionality, meaning that the brake lights and indicators are operated at varying intensities depending on the current driving status and ambient brightness levels (day/night). If the Mercedes driver pushes the brake pedal while stopped at traffic lights, for instance, the brightness of the brake lights will be automatically dimmed to avoid dazzling anyone behind. The light distribution is broadened to ensure the lights do not become too dim and continue to meet all legal requirements. The new S-Class will also offer an advanced night-vision system that can detect pedestrians and animals. In dark areas, the instrument display is switched from the speedometer to a night-view image in which pedestrians or animals are outstanding in color. The system uses two separate infrared light sources in the headlamps to illuminate the area in front of the vehicle, along with a near-infrared camera positioned behind the windscreen next to the rear-view mirror.